What even is that? 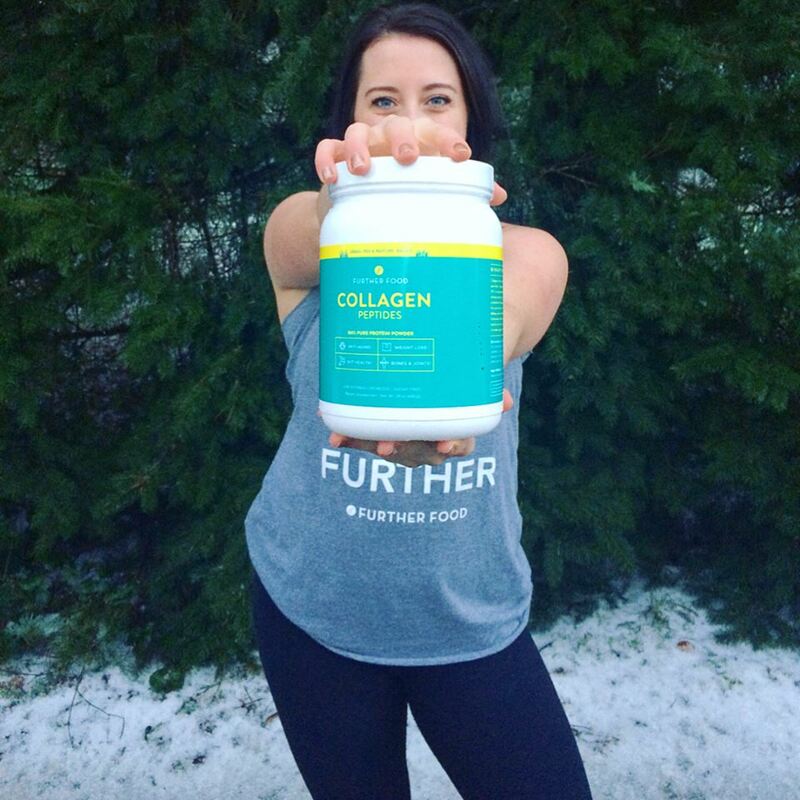 Collagen was not a hot topic for us everyday people until just recently, and although I am stoked more people are becoming more aware of it, why did it get so popular so fast? Collagen is one of the main structural proteins of many parts of the body, such as connective tissues, bones, cartilage, tendons, and skin. Making sure we have an adequate amount of collagen will help us maintain the strength of these important body parts. Collagen fibers make up the middle layer of skin. In general, this layer allows our skin to stretch and also to tighten. Regularly adding collagen into our diet can have an anti-aging effect by tightening the skin. Collagen assists in moisture retention. When our bodies are hydrated, our skin looks softer, more supple and plump, and even younger - another anti-aging effect collagen may have. Ingesting collagen frequently may also encourage your body to naturally produce more on its own. This is a big one because our bodies slow down naturally producing collagen when we hit our mid to late twenties, and continues to slow down the more we age. Certain hydrolyzed collagen from cows, ox, or buffalo (often used in bovine bone grafts) have been tested for helping improve bone loss, decreasing joint pain, and helping with osteoarthritis. Collagen is also found in the lining of your digestive tract, so having more collagen in you body can help with leaky gut syndrome and bowel/ digestive issues. Collagen can suppress skin redness caused by UV lights. Another cosmetic effect collagen may play a role in is hair and nail strength and growth. All in all, collagen can help your body heal from the inside out. Did you know? Collagen is a protein. In short, amino acids are the building blocks that create a protein molecule, such as collagen. Without consuming all of the essential amino acids, we cannot build a protein molecule. These are called "essential" for a semi-obvious reason: the human body cannot create these on its own, so they must be consumed, making them essential for our health. Besides being necessary for protein construction, amino acids are an important aspect in many other bodily functions, like creating a homeostasis environment in our bodies - also referred to as balanced. Collagen comes in two forms that work together and are both important for our health - 1. gelatin (heat-denatured collagen) and 2. collagen peptides (hydrolysate). Hydrolyzed collagen, put simply, are collagen peptides that have been broken down into amino acids that are easy to digest. This is typically the type of collagen powders we see in supplement isles whereas gelatin is often found in baking isles. The more we age, the less we naturally produce collagen. And this, my friends, is why I make sure to add collagen to my diet on a daily basis. I have been using this brand of collagen powder for over a year now and love it. Not only does this brand contain all 8 of the essential amino acids that assist in all of the great benefits, but it is affordable too! This tasteless powder is great to add to almost anything. This isn’t the only brand of collagen I stand by, but it is just the one I use. There are lots of great companies out there with top quality collagen. In order to find a great one for yourself, follow the list below when buying. Research the company and how their collagen is processed. Where does the collagen come from? What is the animal source? Does it contain all 8 essential amino acids and how much? Other natural ways of getting more collagen into our diet is by consuming bone broth. Bone broth is amazing, and is also so easy to make at home if you want! Bone broth is made by simply boiling some sort of bones (I prefer chicken or a high quality beef bone), adding some seasonings (maybe some vegetables in the mix or herbs) and then letting it simmer for a long period of time. That’s the gist, but what is so great is that over that time, the collagen from the bones, along with many other vitamins and minerals, seep out and into the water it is in. So when you drink that liquid, aka the broth, all of those things go in and benefit your body. If you don’t have time to or are not interested in making it, there are plenty of high quality brands out there that strive to bring these benefits to you in no time at all, like Osso Good Bone Broth. Check out my post on my favorite drinks that aren’t coffee where I talk about bone broth and what to look for when buying it at the store. Gelatin is another thing that I try to incorporate into my daily diet but also find hard to. When I do use it, I make sure that it comes from a reputable source and isn’t pumped with anything else. I like this unflavored beef gelatin from Great Lakes. A fun way to eat gelatin is by making jello-bites but with natural fruit juices or even coffee and cream. Crazy right? I like these magnesium gummies and flu blasting gummy bears. Get creative and comment below how you add gelatin to your diet. Please feel free also to comment below how you have found adding collagen into your diet helpful, what it has done for you, how you incorporate it, and even some more questions if you have any! We are all in this health learning thing together, so lets all keep an open mind, sharing our knowledge, and help one another improve. Stay tuned on my Instagram stories (@the_health_hustle) where you will see how I use my collagen on a daily basis. Plus you will get in the know on when I will be doing group bone broth fasts every once in a while! Disclaimer: What is stated above are suggestions from some research experiments and my own personal experiences. I am not claiming any health changes, both good or bad. These are simply suggestions, and one should always talk with their doctor about supplements and do research before adding them to their daily diets. Also, as goes with all foods, just because you are ingesting a certain food does not always mean that your body will digest it properly or absorb the benefits of the food. So again, see your doctor, get some tests done, get educated about your own, unique body. Please also note that much of this research is new and has not been yet tested over a long period of time. What is talked about above is what researchers and people see and experience fist handed.